These workshops focus on some of our more unusual animals, those which can prove a little tricky to care for. Attend one or both across the weekend. 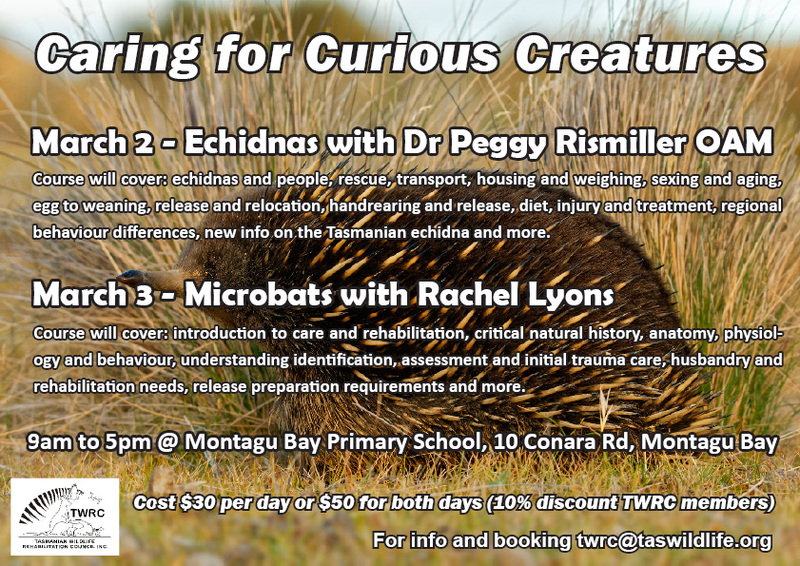 Day 1 9am- 5pm Echidnas – covers a wide range of topics including anatomy, husbandry and rehabilitation. Dr Peggy Rismiller OAM was born in rural Ohio and received her Masters and PhD in Biology in Germany. She is an environmental physiologist and educator who has been studying the interactions of native living organisms and environmental cues on Kangaroo Island since 1988. 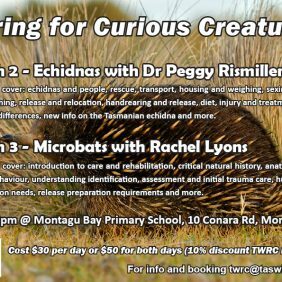 In the past 30 years she has answered long standing questions about echidna biology, cared for many injured echidnas and hand reared innumerable puggles. She has the longest working relationship with individual echidnas in the wild. Peggy supervises undergraduate, graduate students and many volunteers. She works closely with the media, tourism, conservation groups, zoological gardens and the greater community. She is affiliated with the University of Adelaide, senior researcher at the Pelican Lagoon Research & Wildlife Centre, and a visiting lecturer at the Hannover School of Veterinary Science, Germany. Day 2 (am-5pm Microbats – provides an excellent insight into these elusive creatures, their anatomy and physiology, husbandry and rehabilitation. Rachel Lyons is with Wildcare Australia and is based in the Noosa Hinterland, Queensland. Rachel has been a Workshop Trainer and Species Coordinator with Wildcare Australia (South East Queensland) for over 15 years and has rehabilitated various species for over 20 years. Rachel’s interest in microbats started over 15 years ago when she learned of the absence of scientifically sound information regarding the care and rehabilitation of the various species in Australia. She set about researching as much as she could and in 2011 collaborated with Trish Wimberley of the Australian Bat Clinic to develop a full day training workshop and extensive manual on Microbat Rehabilitation. 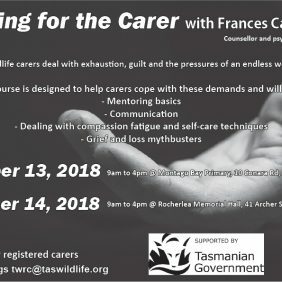 Email twrc@taswildlife.org for information and bookings.